Boom! 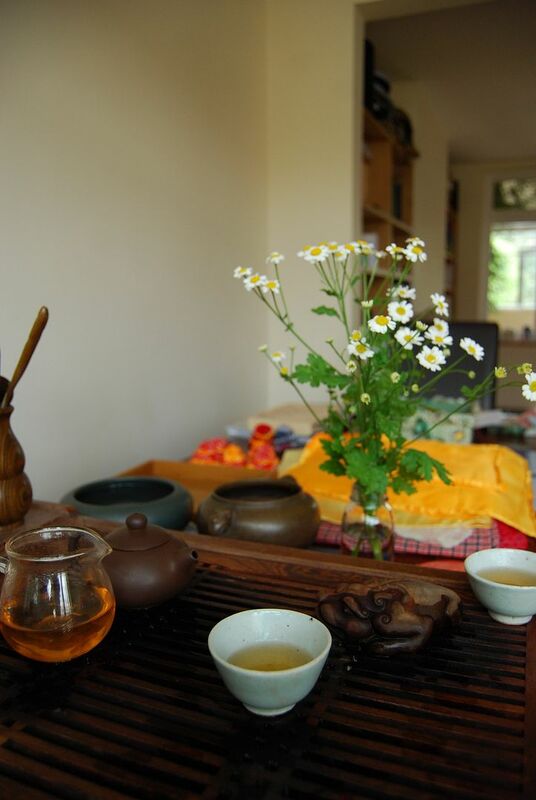 No sooner have I just got ready to get back to Beijing and see my teafriend and erstwhile total dude Xiao Yunqing, among other encounters, then another sterling chap (PM from white2tea) sends me a huge pile of Taochaju teas. I'm ready if you are: Taochaju is typically rather delicious. 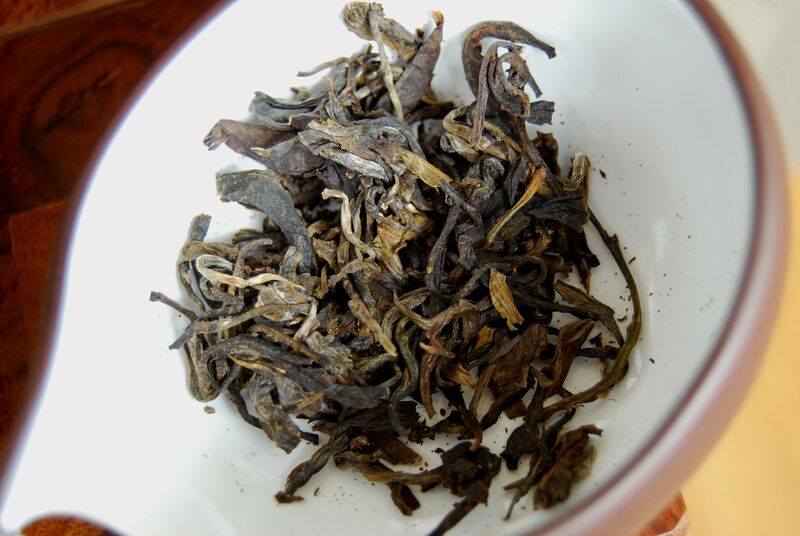 This is the 2008 Taochaju "Laoman'e", which has been stored in Fujian (for some reason). The large, flat leaves, pictured below, are well-preserved in their integrity and slightly brown in colour. The scent is a touch quiet, but interesting. Laoman'e-region cakes can go either way: you're either all-in for a kuwei [good bitterness] session, or you're not. People don't tend to be ambivalent about Laoman'e. For what it's worth, I rather like the place. Like many of Xiao Yunqing's cakes, this takes a while to get going. 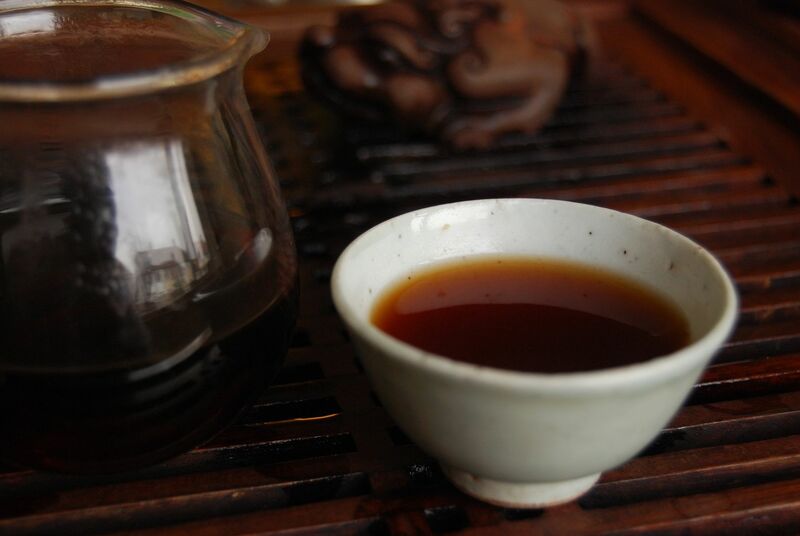 The scent in the wenxiangbei [aroma cup] is absent, at first, but then builds to a complex sweetness. Likewise the flavour of the orange soup (pictured below): the opening is clean sweetness which rapidly builds into a finish of potent kuwei. 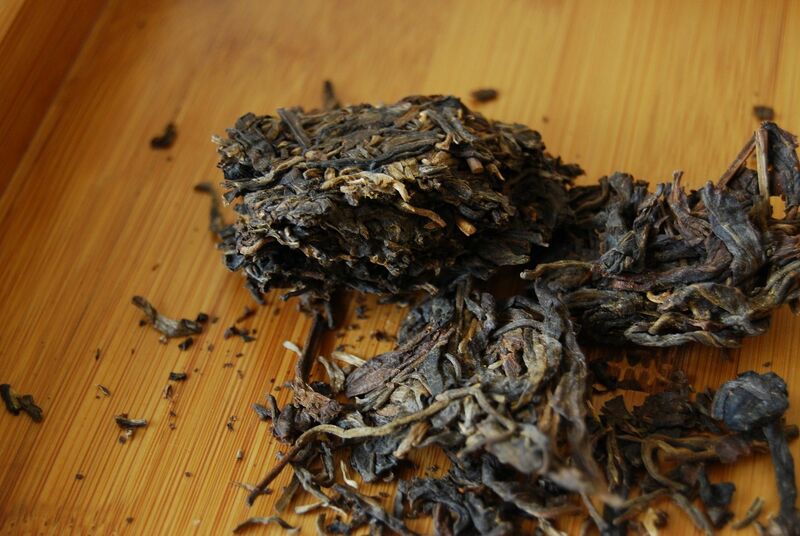 It has rich, low notes of tobacco for the nose to enjoy, and currently has a tangy flavour, with something of molasses about it. The sticky darkness reminds me of dark chocolate. "This tea is above average", notes my dear wife, damning it with faint praise. Nevertheless, I rather like its continuing sweetness. 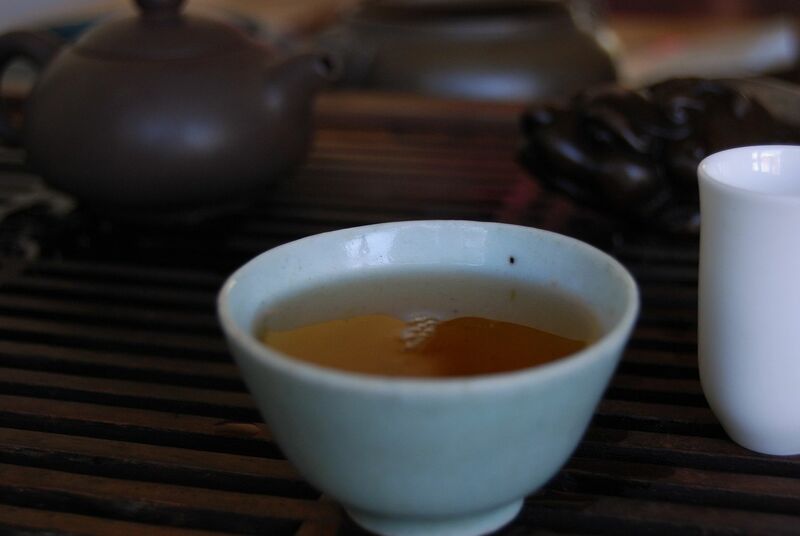 By the seventh infusion, the soup darkness begins to taste suspiciously "particulate", as if that aspect of the tea were introduced by the processing. Nice, but not one of Xiao Yunqing's best. It seems to be out of stock at white2tea, where it sold for $88. 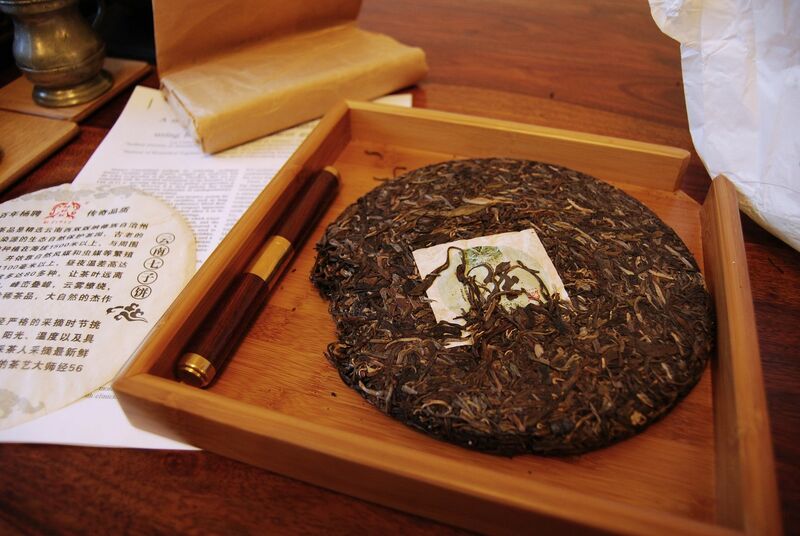 This 2011 "Mengsong Guyun" currently sells for $32 at white2tea, where the cakes were actually pressed in 2012. 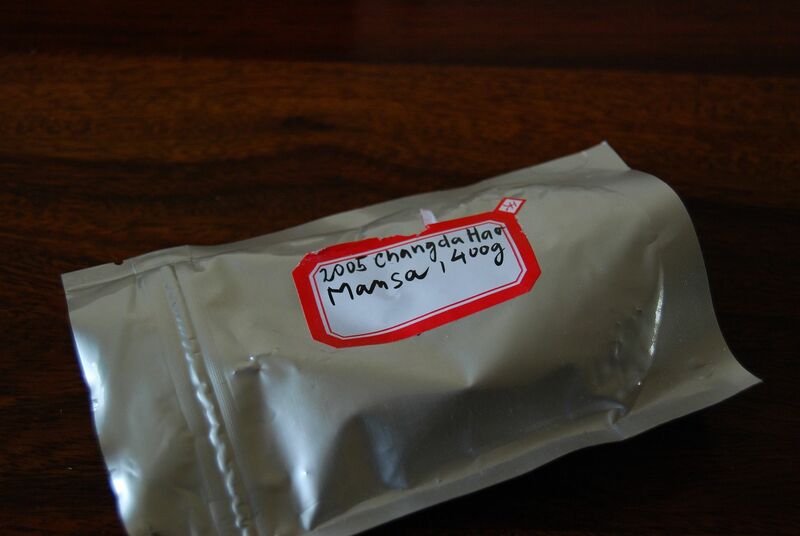 Xiao Yunqing often has some sort of lag between maocha age and pressing date, and I may be right in recalling that this is because he bought maocha from previous years in his recent visits. For $30, you get some very pretty, long leaves, shown above and below. They have a highly advanced and rather fruity scent. Thick in body, with a lightly cooling finish, I find it to be quite strong and rather energising. There is a decent flavour of pseudo-'Banna robustness, but I find it difficult to love it too much. Yikes, my journal ends with "The Mengsong is rather ordinary". That said, it is priced at a very low level, and makes no claims to being other than straightforward. 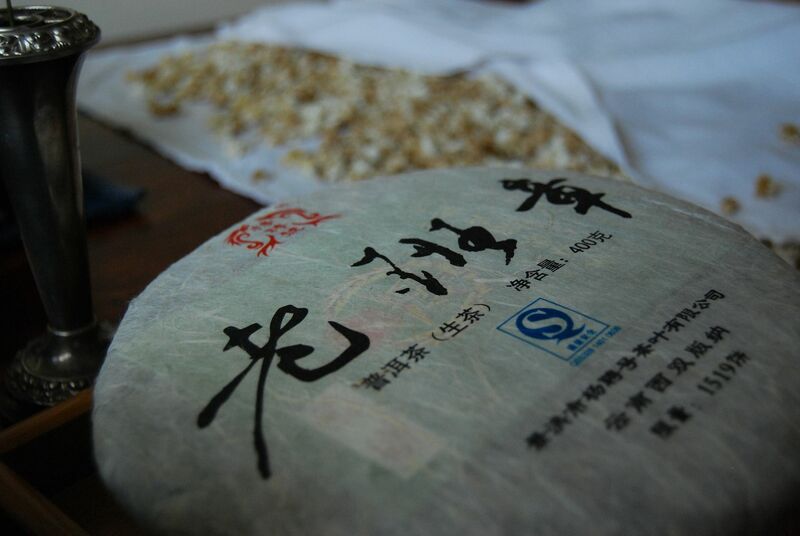 See also the 2011 Taochaju "Banna Guyun", the 2011 Taochaju "Nannuo Guyun", and the 2012 Taochaju "Guafengzhai". How Hao is Your Changdahao? Changdahao and I go way back - back to when they were also called Yiwu Manluo. 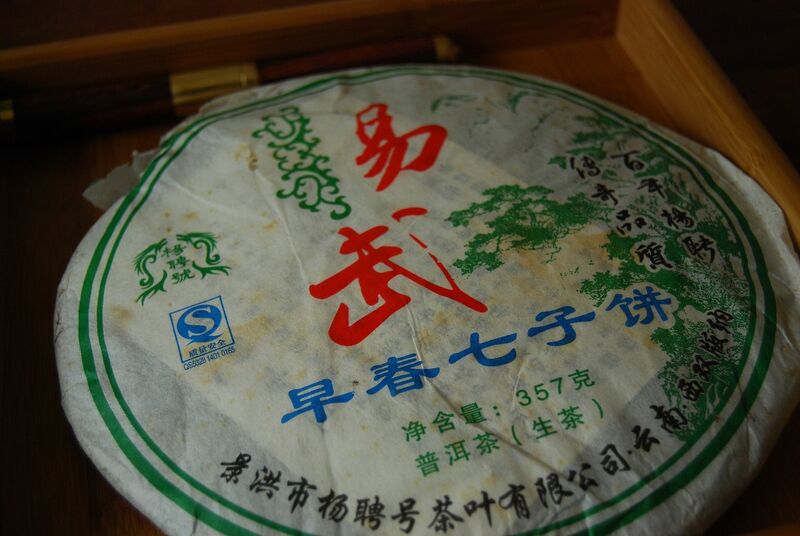 I love one particular Yiwuzhengshan cake from 2003 and 2005, and have scoured Taobaowang high and low to recover a decent quantity of them. 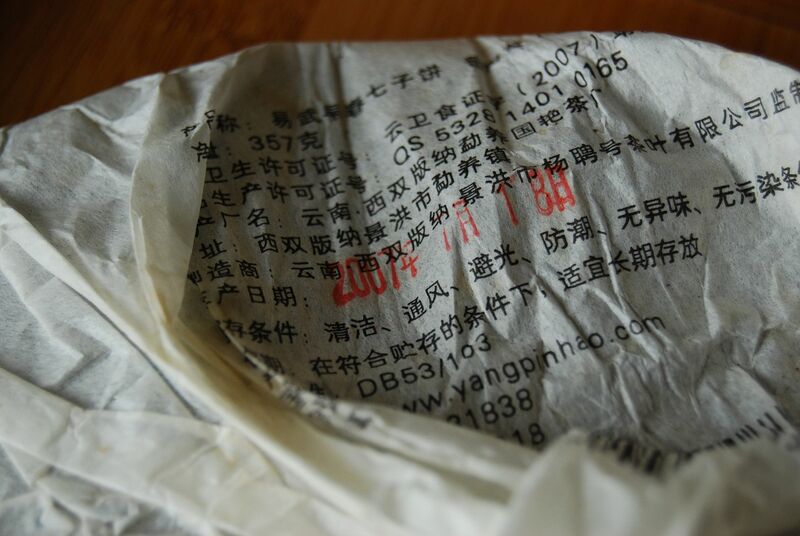 This is another 2005 Changdahao, although entirely different as may be seen from the wrapper above. This is their "Mansa" cake, making it good ol' fashioned 'Banna tea. 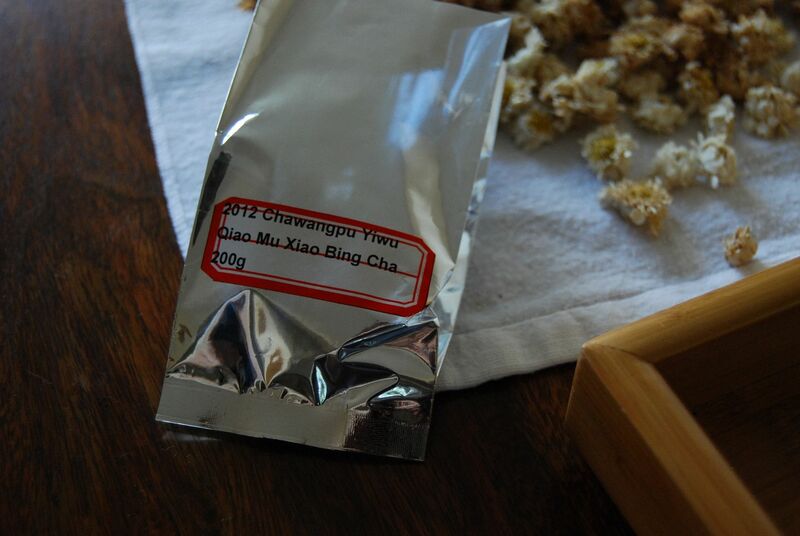 The sample was kindly provided by Chawangshop, where the 40g cake sells for a little over $40. 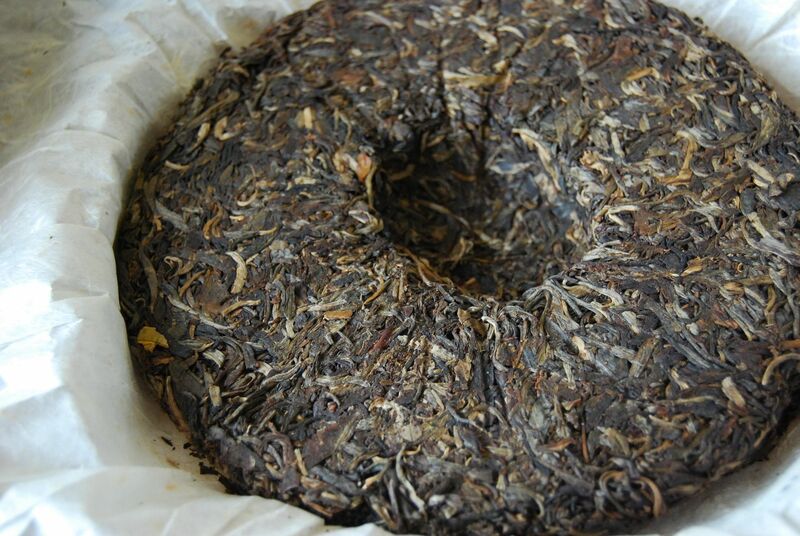 This is part of a "six famous tea mountains" set produced by Changdahao in 2005, and Honza, the owner of Chawangshop, selected this cake as being one of the best from that run. Stop press: they also appear to sell my beloved 2003 and 2005 versions of the Yiwuzhengshan. Can Chawangpu read my mind?! I am now totally in the mood for Changdahao cakes. Simple, strong, aging wonderfully - what's not to like? 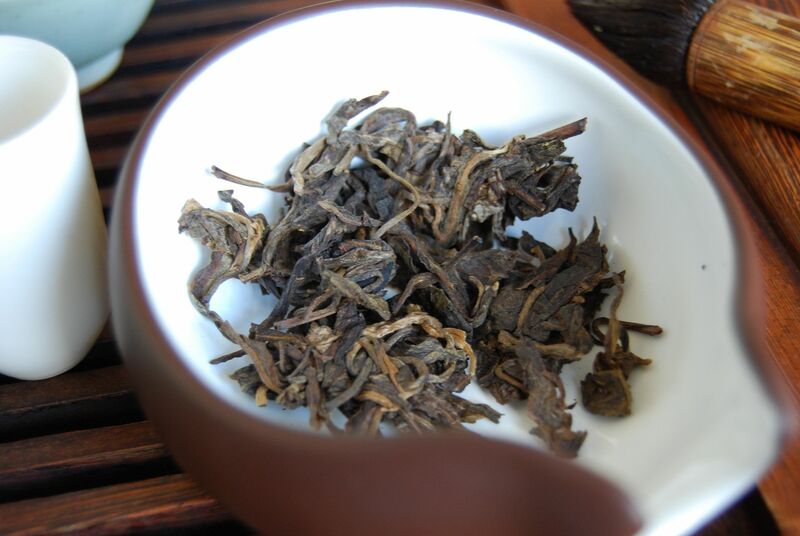 The leaves are typical Changdahao: not pretty, but strong and healthy. Brewing it results in the heavy orange soup pictured below, with the distinct character of damp molasses. I mean that in a nice way. 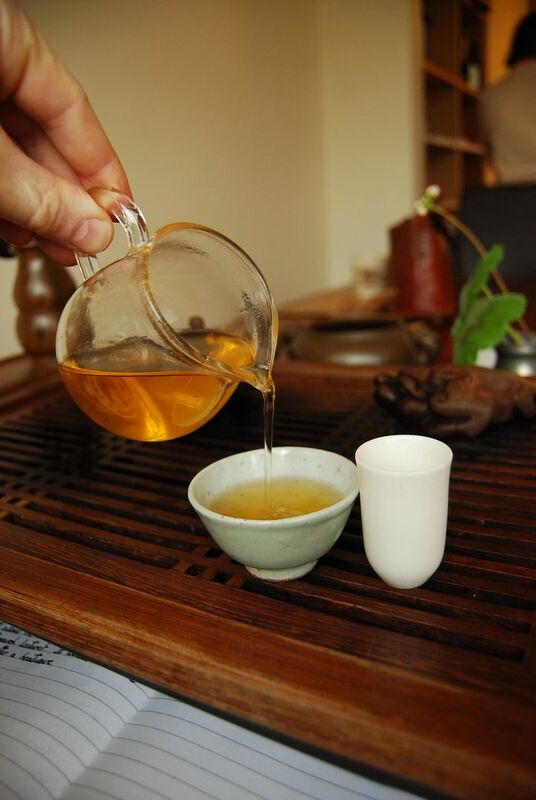 There is a very welcome sweetness of warm honey, and a light cooling sensation. 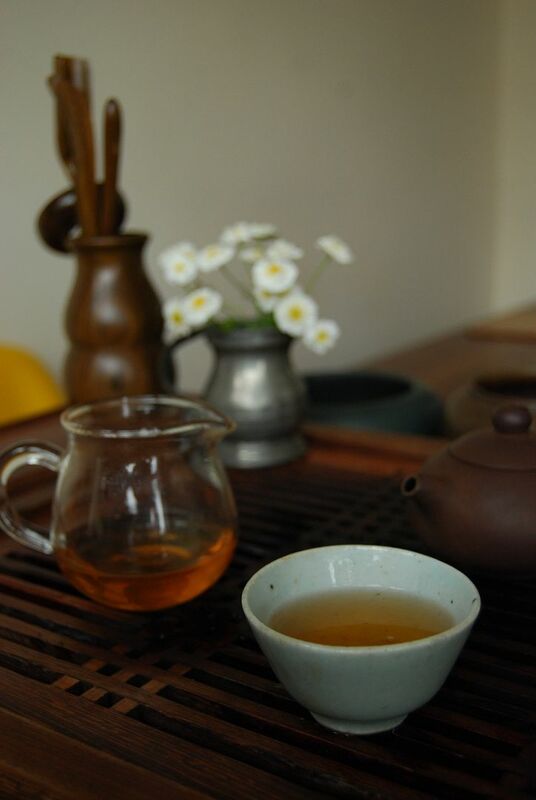 My dear Xiaohu joined me for several cups. He was a little unwell last night, and so I spent the night curled up at his bedside, waking with no feeling in my numb legs. He is now pushing a noisy police car around and appears to be back to firing on all cylinders. 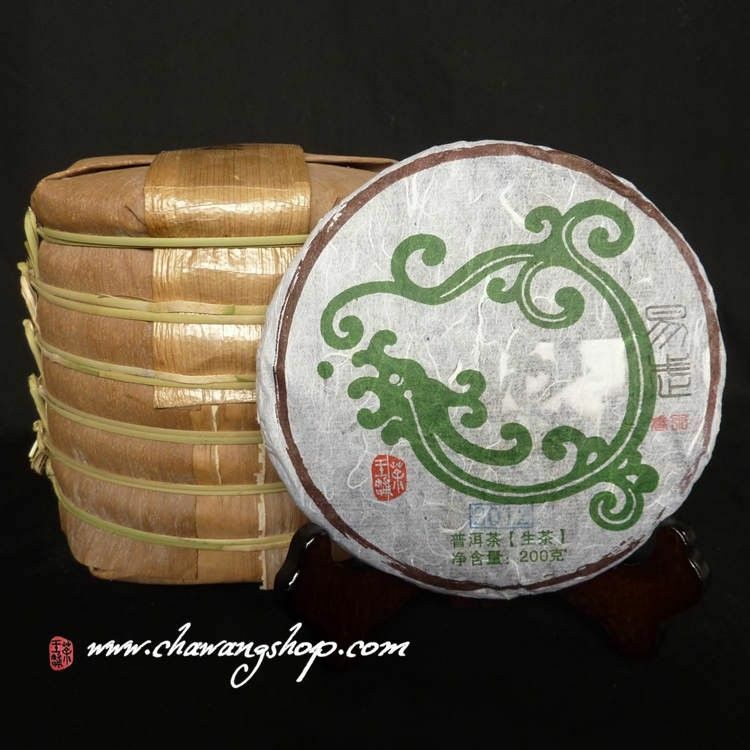 The Mansa cake reminds me of the Yiwuzhengshan cakes that I have loved so very much in the past. 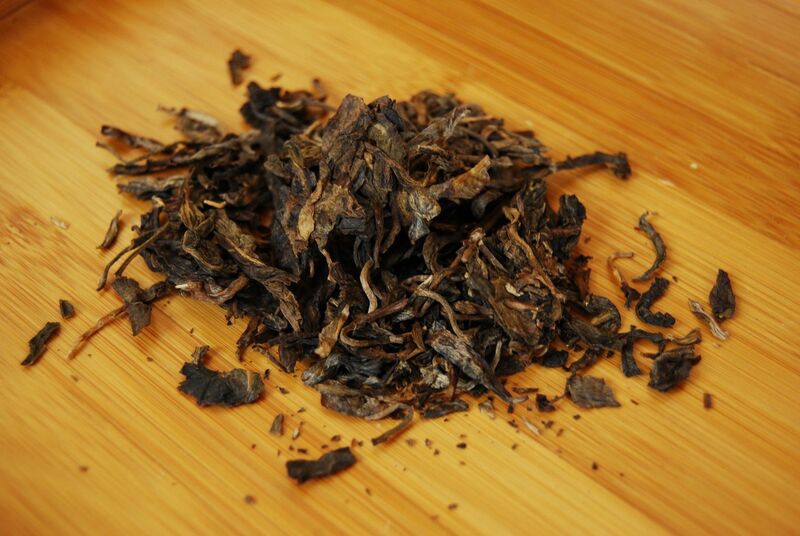 It has the same rich flintiness, and the same sweet-straw nature. The two regions are fairly close, but I suspect that much of the commonality comes from the processing. Enduring, sharp, dense - it has virtually no roughness. Perhaps it is a little below the par of my original favourites, but I can imagine it improving a little further. The low molasses ceiling hints that any improvements will be minor, however - it feels as if it has very little room to manoeuvre. For $40, I am tempted. 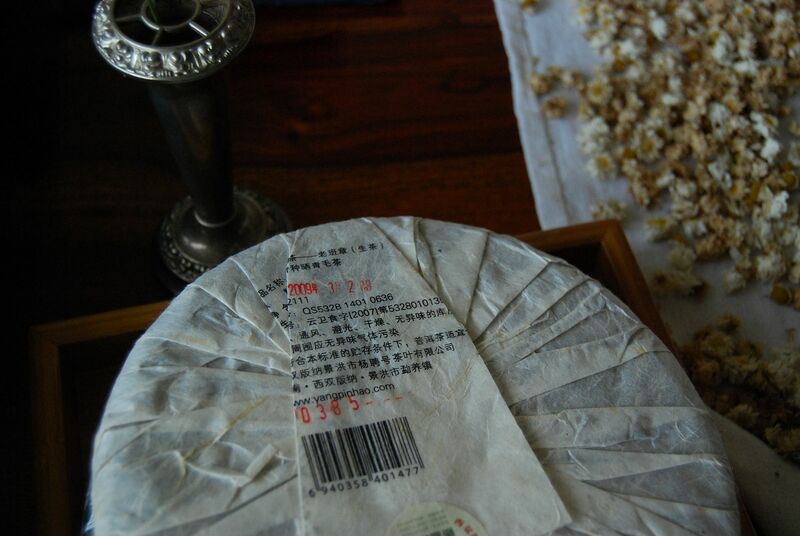 Equally cheap-and-cheerful, this 2012 "Yiwu Qiaomu" xiaobing is $12.50 for a 200g xiaobing (i.e., $25 for a real amount). I appreciate Chawangpu, the brand made by Honza, in that it provides solid thrills with a highly honourable price-tag. 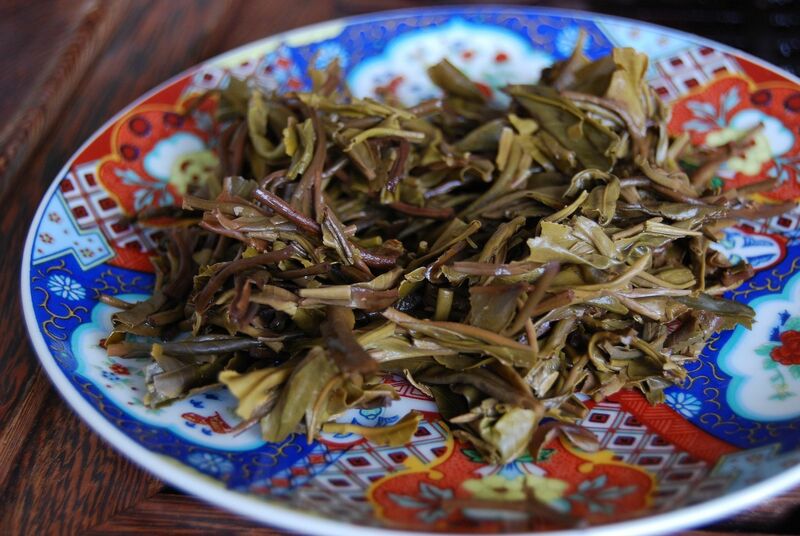 The leaves are from (i) Sanhe laozhai [old-village], quite near to Yiwu town, and (ii) from three different families in Zhangjiawan xinzhai [new-village]. Chawangshop made a "Zhangjiawan" cake from the latter, too (more on which later), making this "Yiwu" cake the more general denomination. The yellow soup has a fresh, sweet scent - maybe a tad empty in the centre. 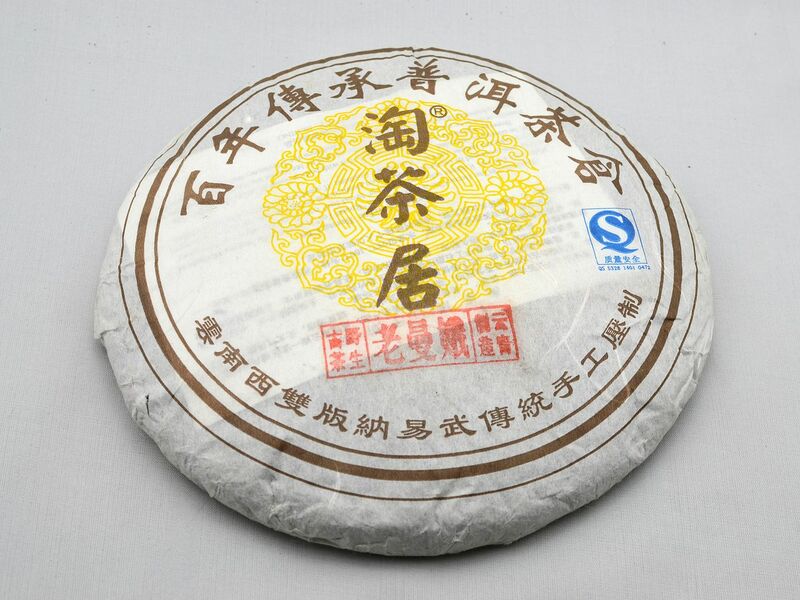 It is a tangy, sweet Yiwu with a cooling finish and long, gentle shengjin [mouth-watering characteristic]. The aftertaste, unusually, is the dominant sensation; that which comes before is neither one thing nor the other. 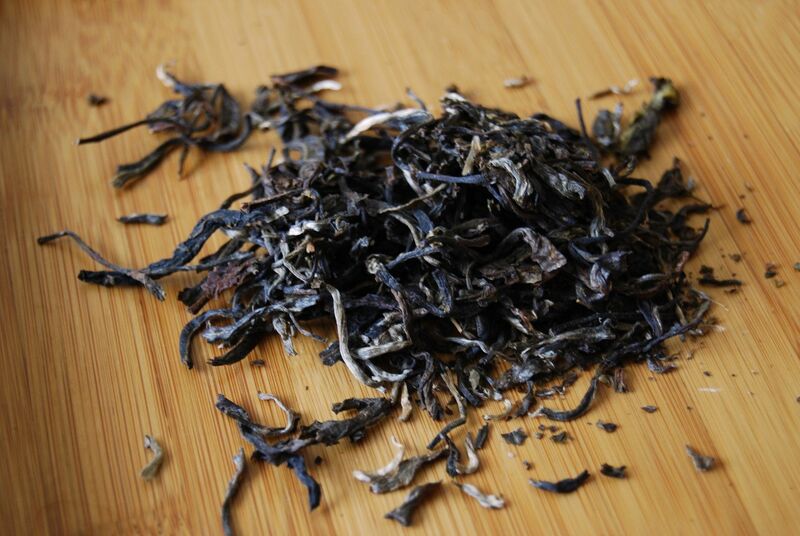 Could this be the result of attempting to blend four different types of maocha? 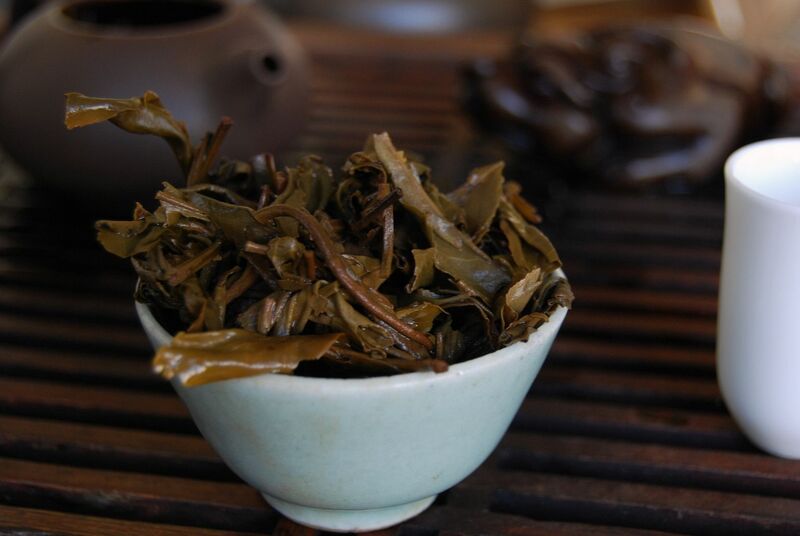 I enjoy the quality of the leaves: cooling, shengjin, and rather heavy in caffeine / chaqi. 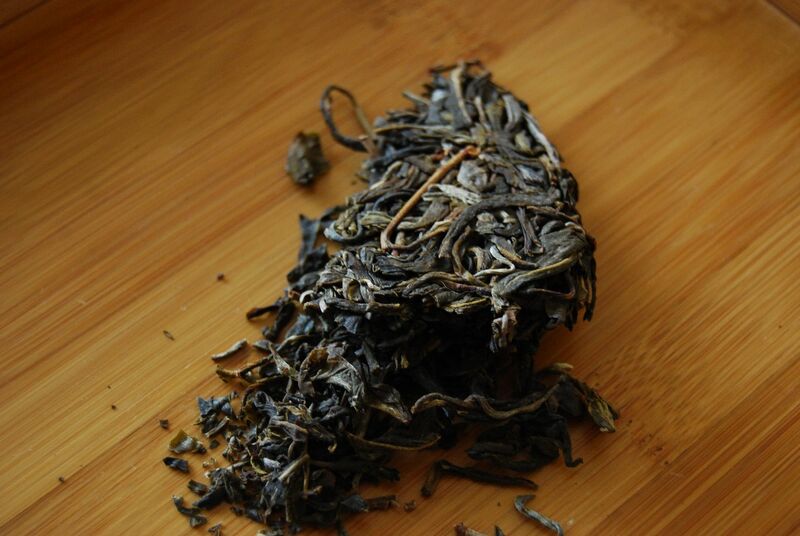 While this tea is good for the (very low) price, it is difficult for me to enjoy too much: the pleasant kuwei [good bitterness] exists alongside a brown-green flavour that seems at times almost sour. The Changdahao was definitely the winner today. 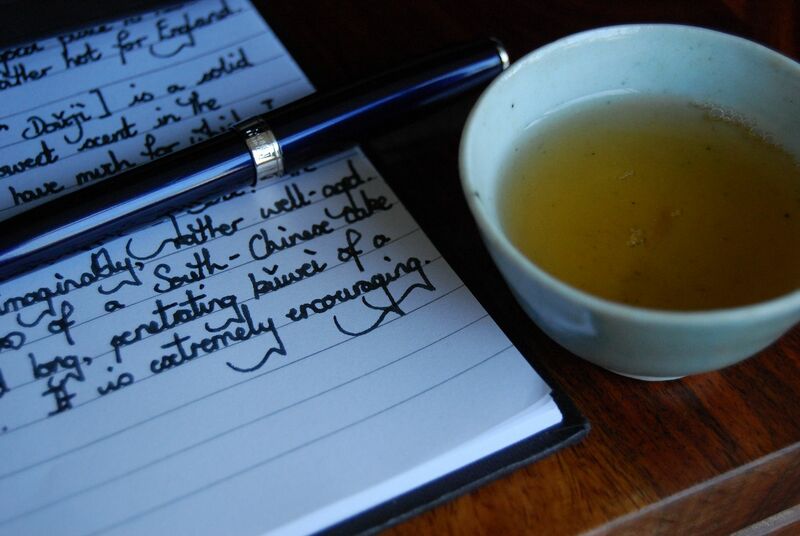 My entirely-too-generous teachum from Singapore, Keng, provided both of the teas for today's article. 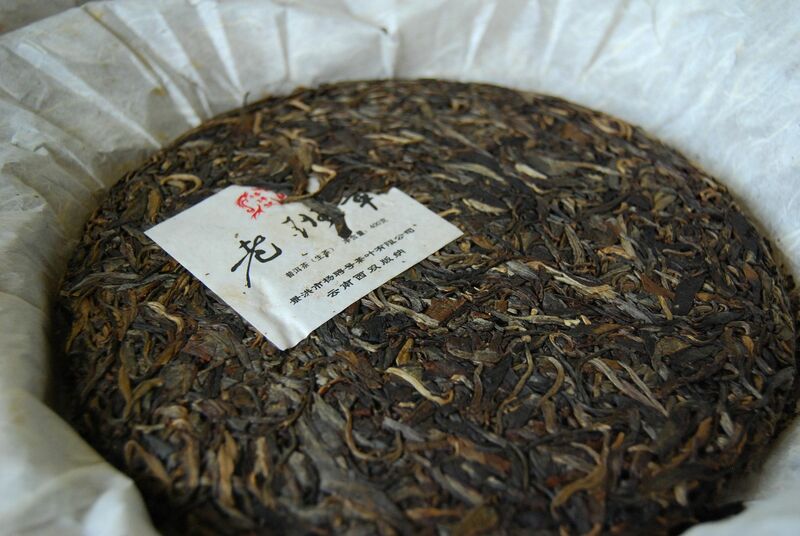 First, timely for the year in which it was made, the 2012 "Tengshengshi Long" from Yangpinhao. With some amusement, I notice that the name "Tengshengshi" absolutely disgusts my dear wife, where it is something similar to "prosperous society". She heartily rejects such vulgarities, and it is always instructive to discover new ones. 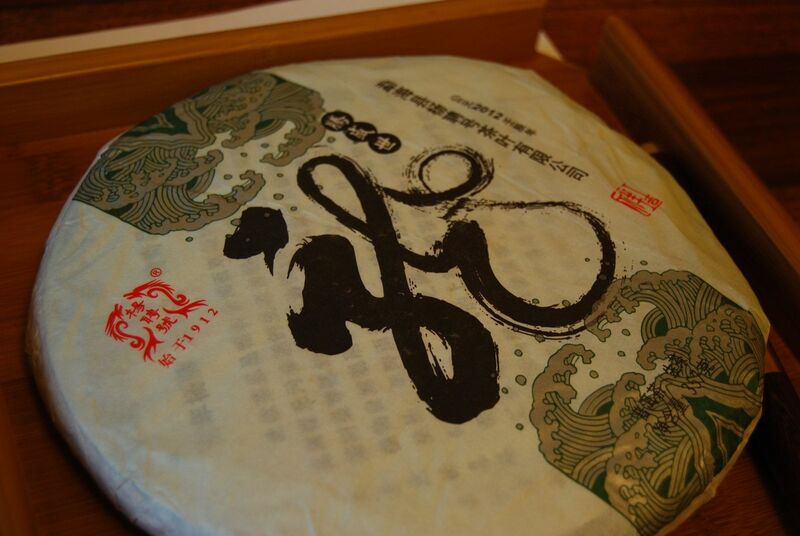 The neifei (pictured below) reads "longbing" [dragon cake] and the wrapper, shown above, is dominated by the "long" character [dragon]. 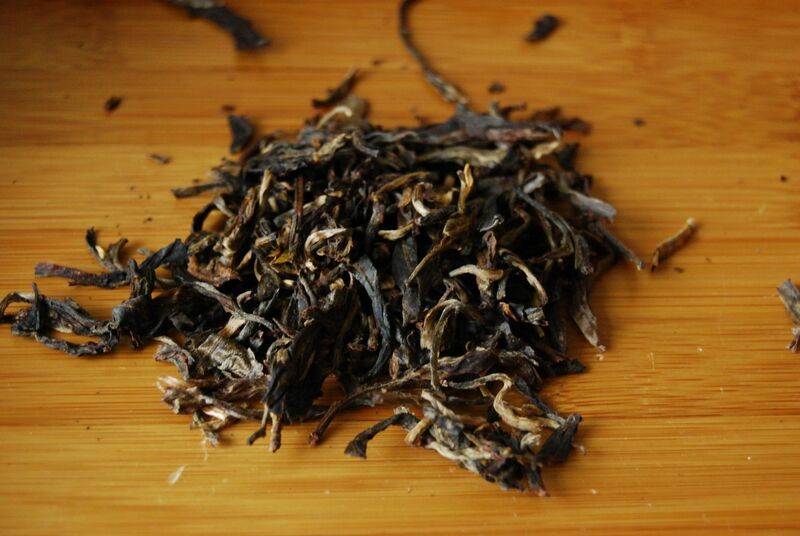 The well-compress bing has small, dark leaves and a satisfyingly pungent aroma - it has the scent of "real pu'ercha". Shown below, the yellow-orange soup carries the sweet and still slightly smoky aroma of the dry bing. 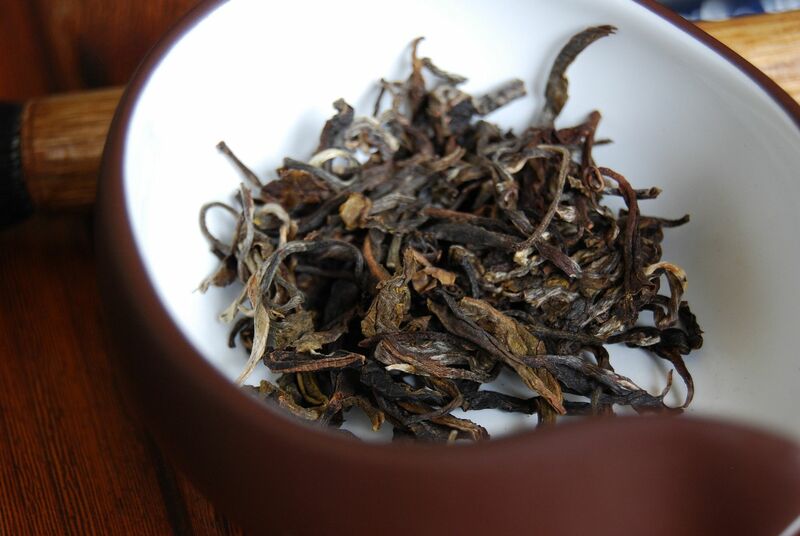 First impressions: extremely thick, densely sweet, those smoky scents in the nose, combined with kuwei [good bitterness]. Very good, in fact. Keng is good enough to have provided me with many of Yangpinhao's cakes over the years, but this is the first that tastes explicitly like Dayi. I don't think I've ever come across another factory that has managed to recreate the Dayi house style with any success, but this one certainly gives it a good go. It remains stable and strong, much like Dayi, and I have consequently Dayi-esque hopes for its aging. 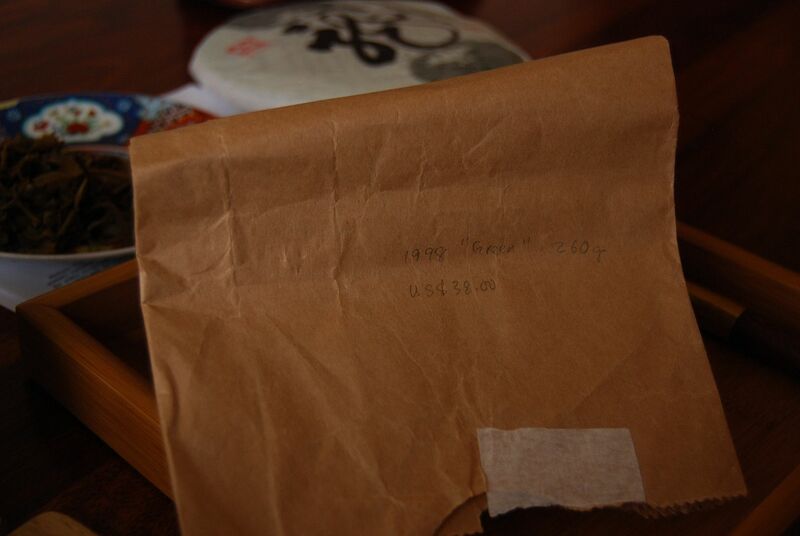 Finally, a 1998 "Gaoshan Yunwu" brick, where "yunwu" means "cloud and mist". The reverse of the brick has dimples from the compression system. I jimmy a few leaves from the block. 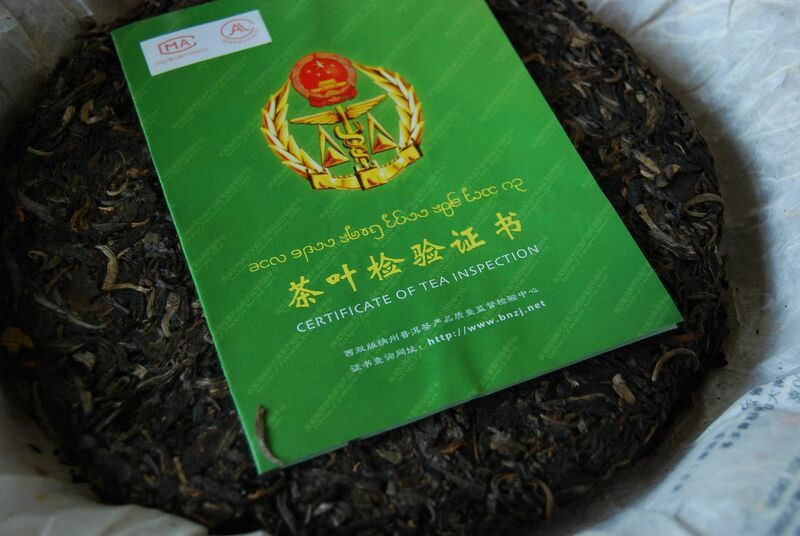 They are small and fragmented, much as one might expect for zhuancha [brick tea], which is seldom material of quality. You never know, though - good bricks exist. 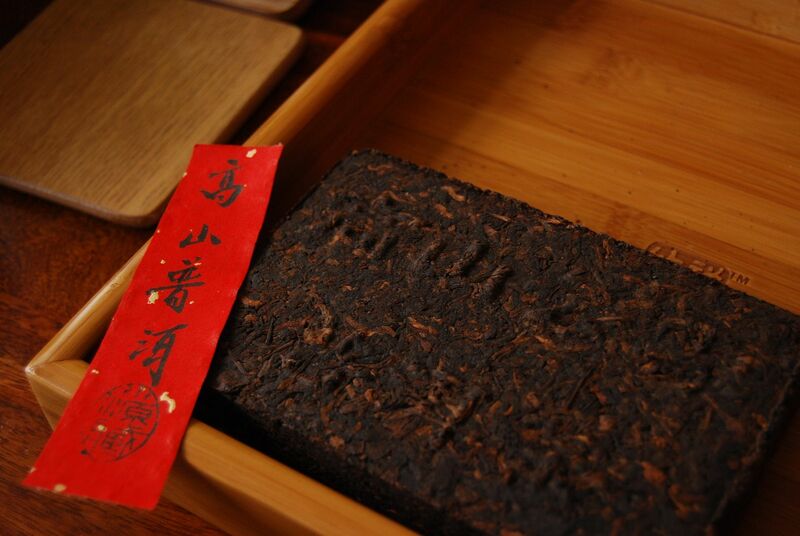 This may be one of those good bricks: it has a charming red-orange soup, and its scent is pure humidity. 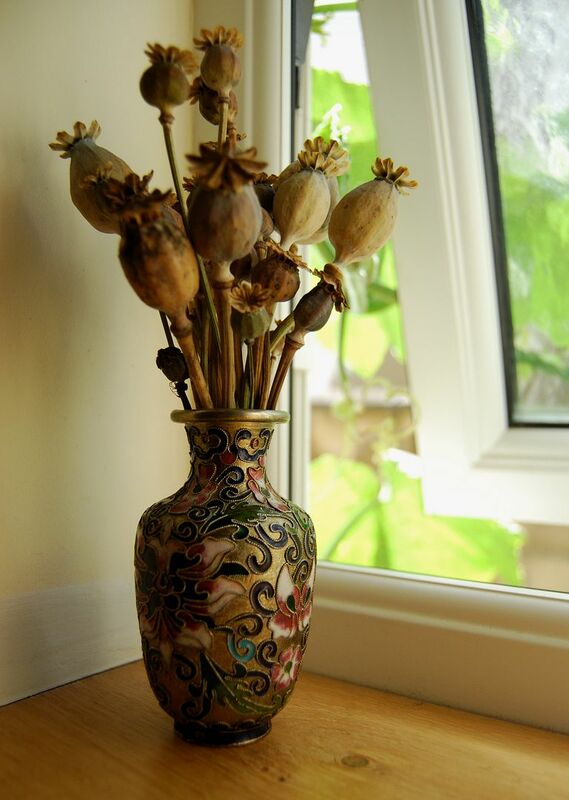 The sweet, powdery flavour is smooth and lovely. 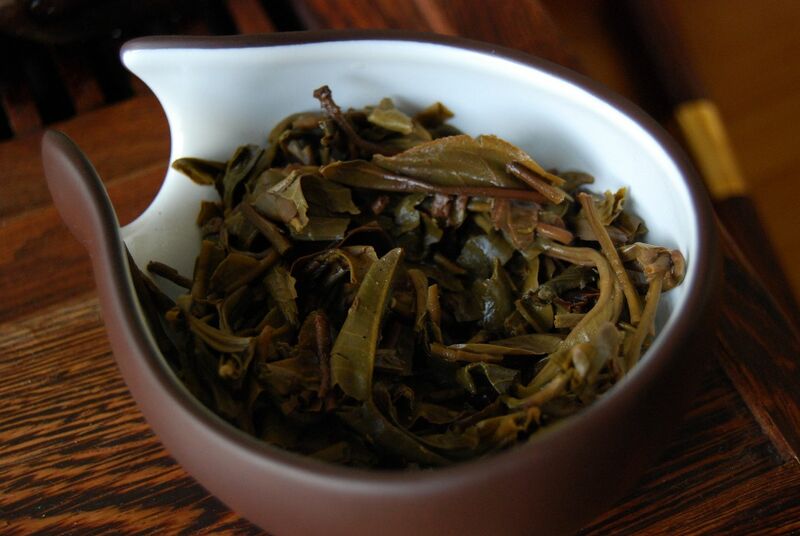 It grows ever thicker and ever sweeter as the leaves open in consecutive infusions. There is no kuwei [good bitterness], and a gentle huigan [returning sweetness], but is pure and satisfying. It imparts a certain warmth and comfort to my body, far in excess of its actual temperature. It fades, ever so gently, but remains delightful. The bag in which this came reads $38, which is surely a rather decent bargain. ...you discover untasted cakes that you cannot remember buying. 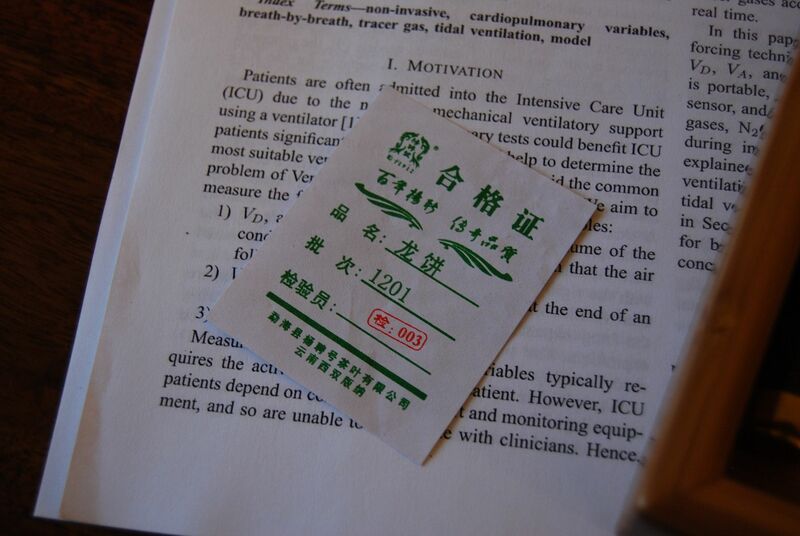 According to my notes, this cost 60 RMB before overheads, from Taobao, in 2009. The current price is quadruple that, in just four years. P.s. Hi from Beijing. I just landed and spent the afternoon drinking tea with PM of white2tea, who is 1x awesome chap, despite being American. This is Basic Douji. The blends are tasty, but I have no idea how they will age. The 2008 version and 2012 version were both decent, but what really makes me happy about Douji from a few years ago is the low prices, combined with that reliability. Obviously, they are not going to turn into frightfully amazing classics, but we can hope for a little something, given the strength of their backbone. If you've ever tried to get into a Douji cake, you know the sheer agony of the images above and below. Those big stickers cannot come off without major collateral damage! Perhaps this is a misguided attempt at controlling for people tinkering with the contents of wrappers. So, this is four years old. 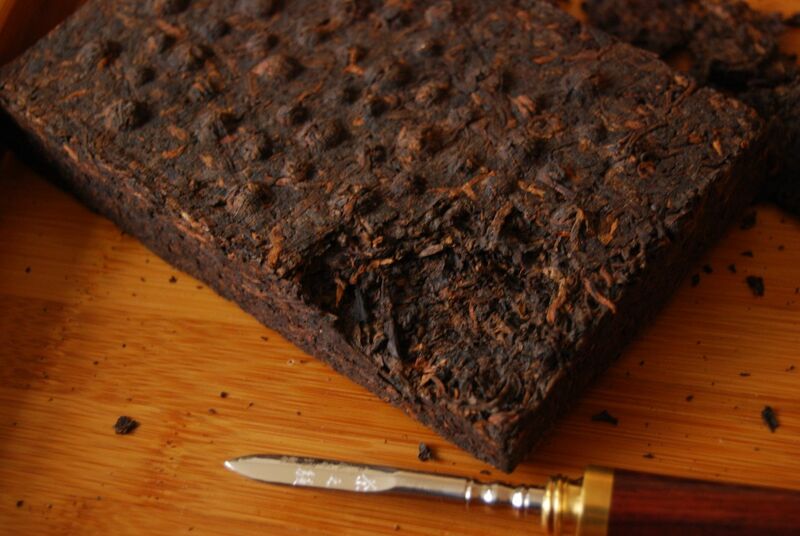 The leaves are dark and mostly whole, as pictured below, and I am struck by the forthright aroma of the cake. It really has a lot of activity. The compression is just about right: one can withdraw leaves without too much trouble, but they are compressed enough to help the aging process. 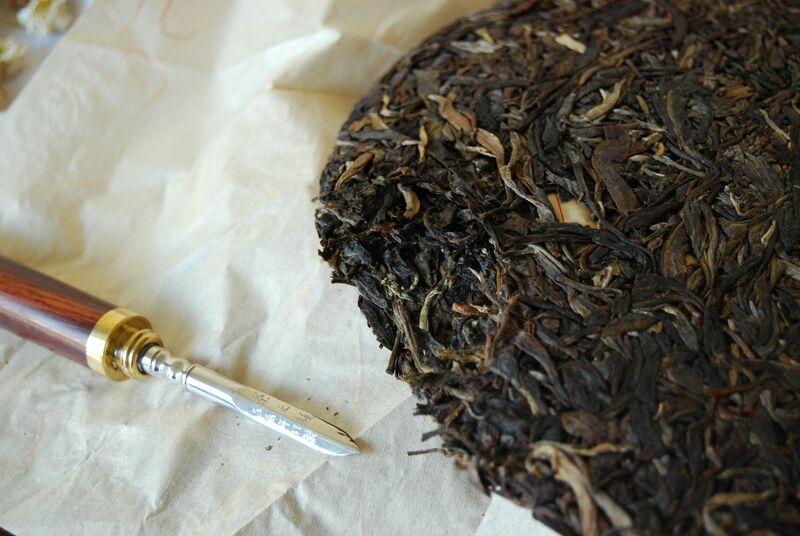 Shown below, the resulting leaves are long and luxurious - surprisingly so for a very humble blend. This cake has been stored nowhere except for our house, and so it is a fascinating (and rather nerve-wracking) "control" for my experiments. 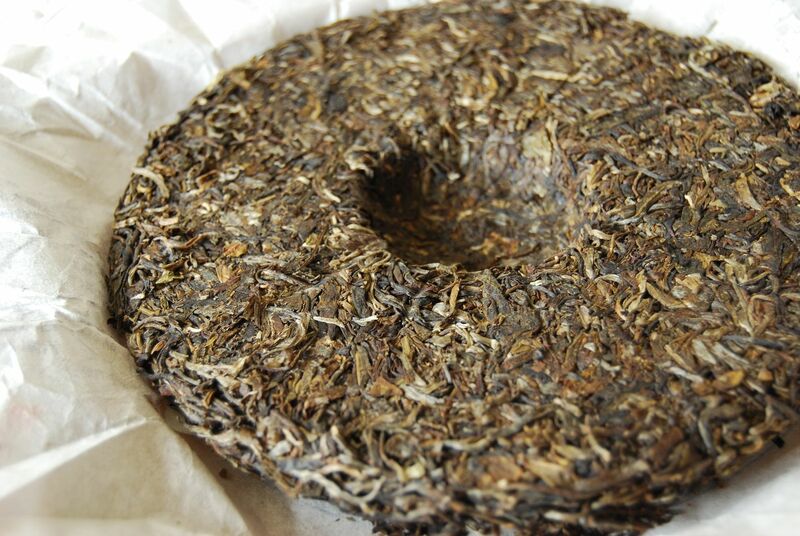 Happily, it has the dense sweetness of decent storage, with the endurance and long, penetrating kuwei [good bitterness] of a young cake. It is extremely encouraging. 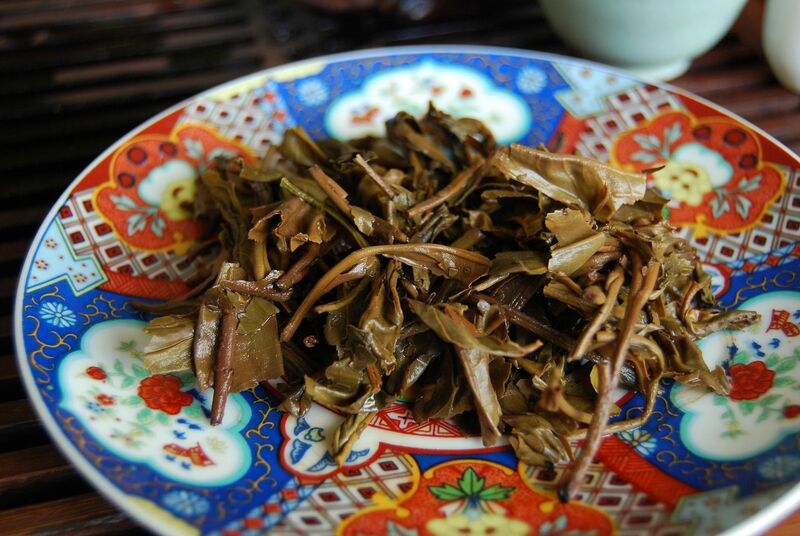 The leaves, shown above, are healthy and thick with little wastage, and no sign of weakness. For a fundamentally basic cake, that cost next-to-nothing, this has come on incredibly well. I allow myself a little hope for the remainder of our collection. I am packing for Beijing, and it is strange: England is current 9 degrees Celsius. I am wearing thick trousers, a waistcoat, and a jacket. I almost wore gloves yesterday. 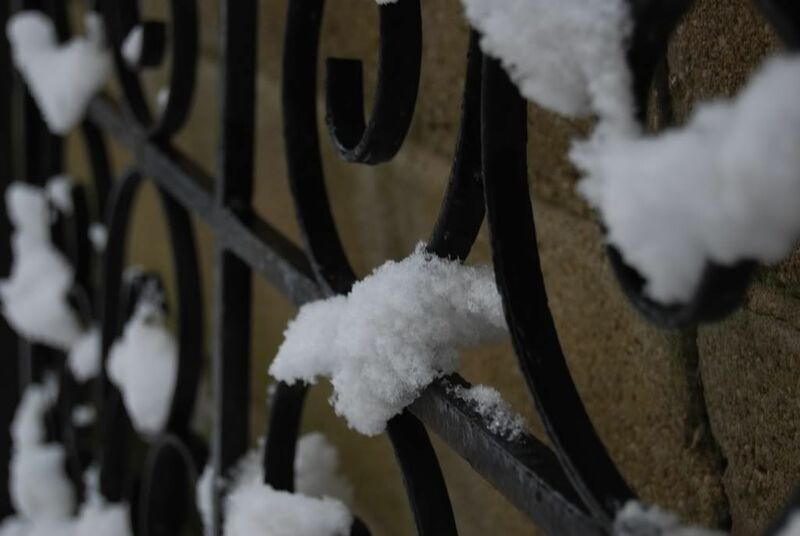 Snow is forecast for next week. Meanwhile, Beijing is 32 degrees. Crazy. 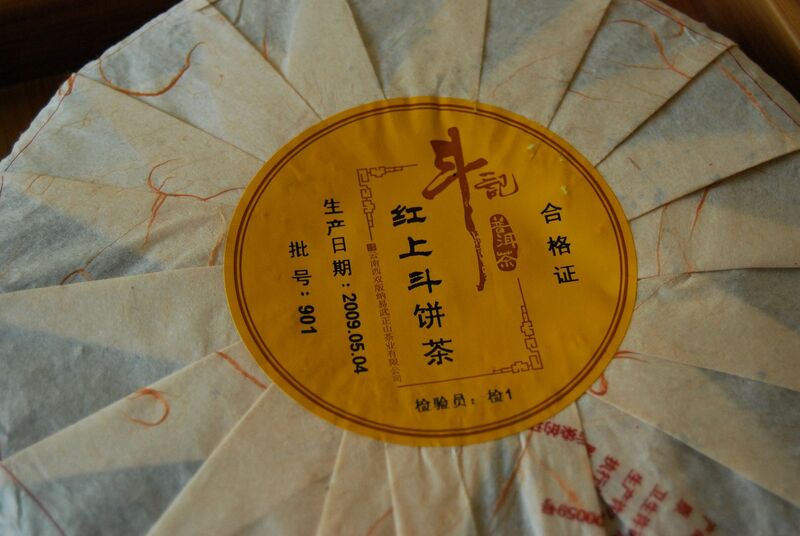 A cake provided generously by Keng, this is a Yangpinhao "Laobanzhang". Needless to write, one has to be careful with "Laobanzhang". 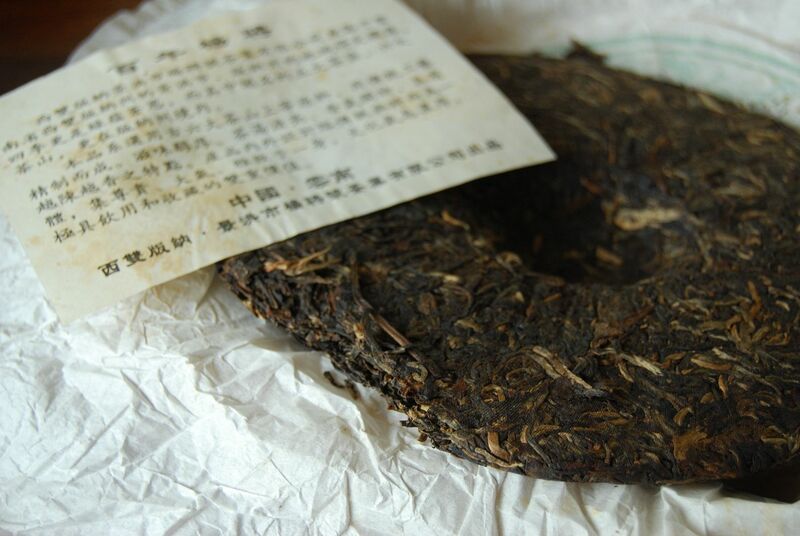 Leaves from the village, by 2009, were (and remain) very expensive, and it is highly unlikely that a down-to-earth cake from Yangpinhao has much, if any, actual content deriving from the area that gives it its name. Maybe the leaves came from Xinbanzhang, the neighbouring village, at best; maybe they came from the wider region surrounding the Banzhang area, perhaps more likely. The large leaves of the cake, shown below, look very appealing to me, even as I sit at my desk and write about it in retrospect. Some cakes demand to be picked up and brewed, and the images in this article give me such an impression. Rhubarb aside, the cake looks very pleasant indeed. The compression is not-too-tight, not-too-loose, but just right. I liberate leaves without damage. 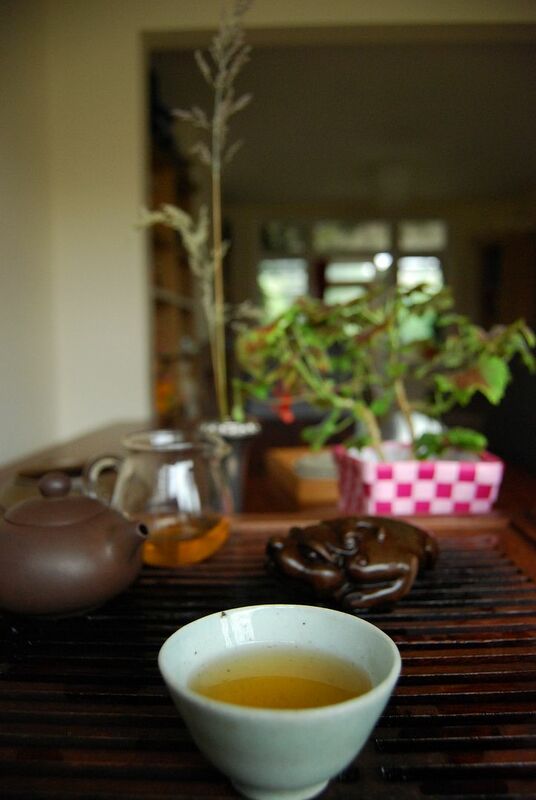 The tea opens with a decent sweetness not entirely dissimilar to, would you believe it?, Laobanzhang. Have the cheeky monkeys at Yangpinhao somehow pulled off the unlikely? 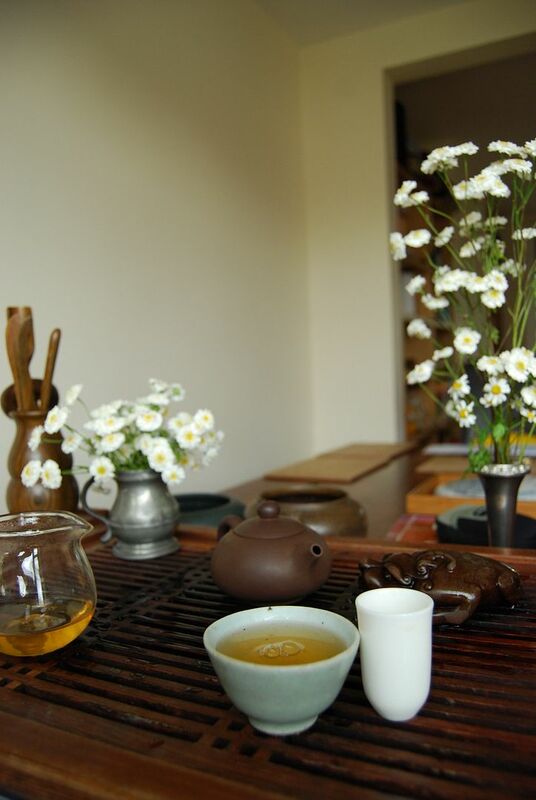 The familiar sweetness rapidly inflates into a large, stubborn (but enjoyable) kuwei [good bitterness], and it is here that we find the body of the tea, and the presumed majority of its leaves. We must reel in the rhetoric, for this is, as we should expect from the brand, solid but not likely to change the world. 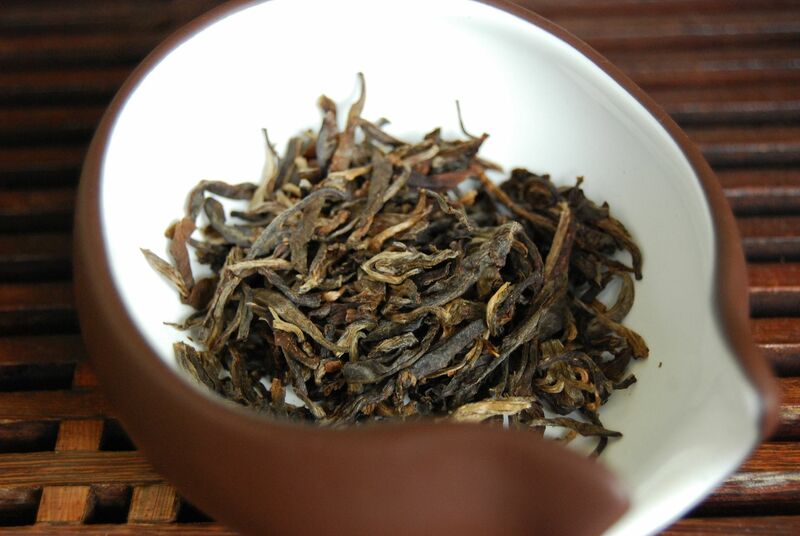 Yangpinhao makes no claim to such grandeur, however, and they seem to cut a good line between price and quality. Trade-offs have been made, inevitably, but the result is quite respectable. 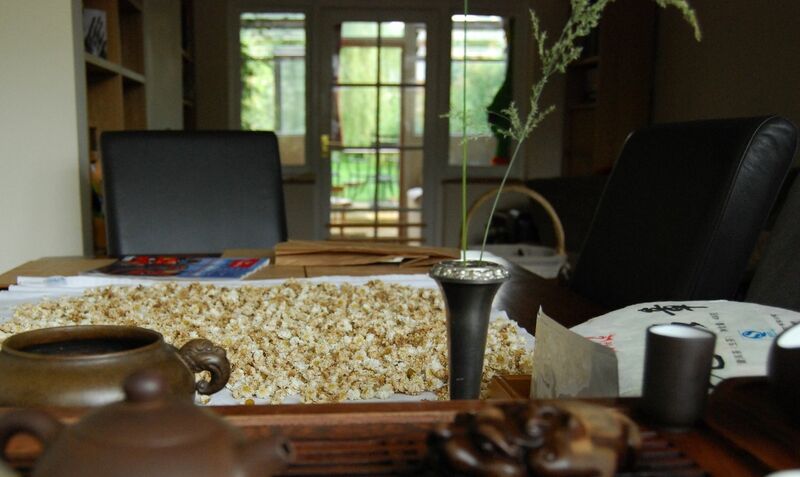 This tea is at the better end of "mainstream", and is commended by its solid huigan [returning sweetness], and the comforting sensations afforded by its caffeine / chaqi. I can feel myself thawing. Next time you're browsing Taobaowang, keep an eye open for Yangpinhao bargains. You might be surprised at exactly how much strength you can get for a very reasonable price. If you happen to live in Singapore, as does Keng, then strong-yet-simple examples like this are a very safe bet for longer-term storage. 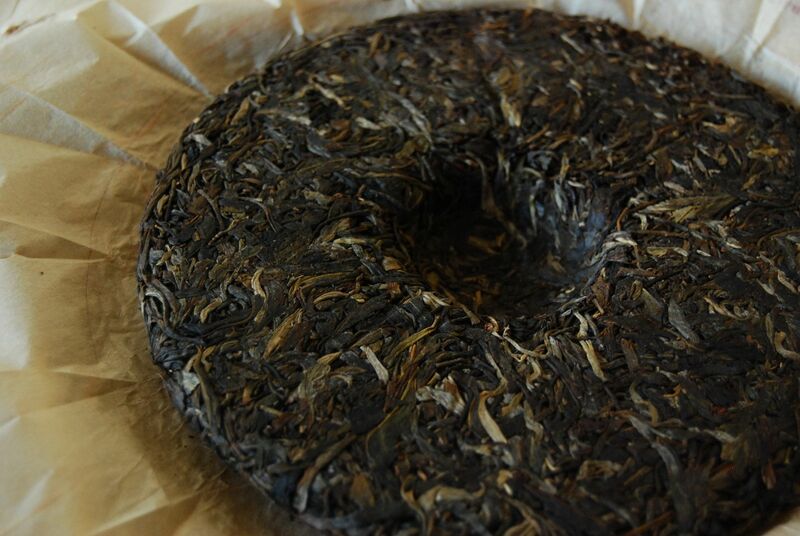 Singaporean tea maestro and all-around nice guy, Keng, has very kindly sent me a bunch of solid, down-to-earth cakes that have aged a treat in Singapore's humid heat. 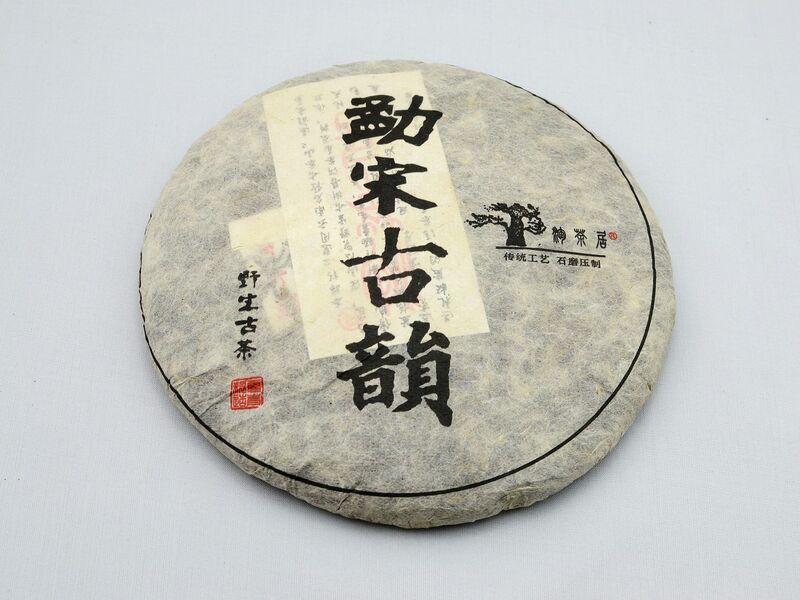 This first cake is the 2007 Yangpinhao "Yiwu Zaochun", meaning "early spring". 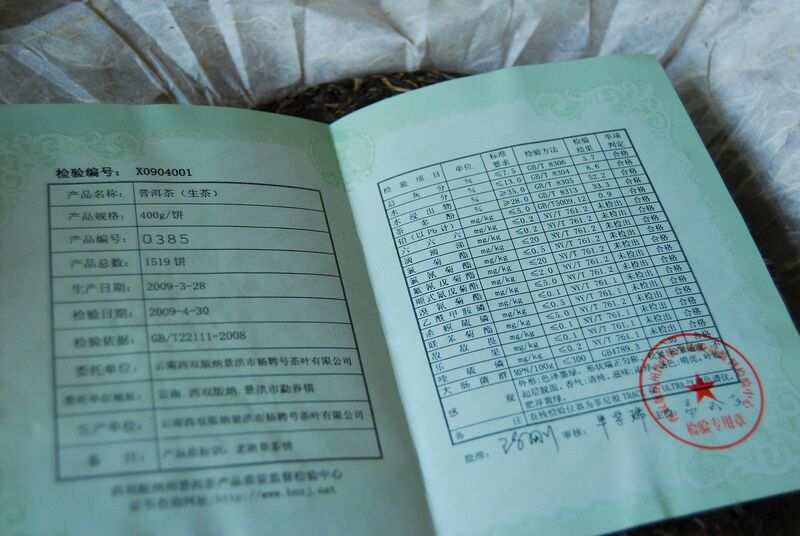 Shown below, this cake was produced on 18 July - substantially after zaochun! Let us assume for now that we should give Yangpinhao the benefit of the doubt, and that the leaves were harvested (much) earlier. The cake itself is quite beautiful, and is a "tiebing" [iron cake], having been pressed by hydraulic power. Despite the high compression that occurs as a result, this has aged very well - presumably due to the magical effect of Singapore's environment. The aroma of the leaves is obviously aged. Now six years old, the colour of the soup is in concordance with that which we might expect. Shown below, it has a heavy, orange colour. 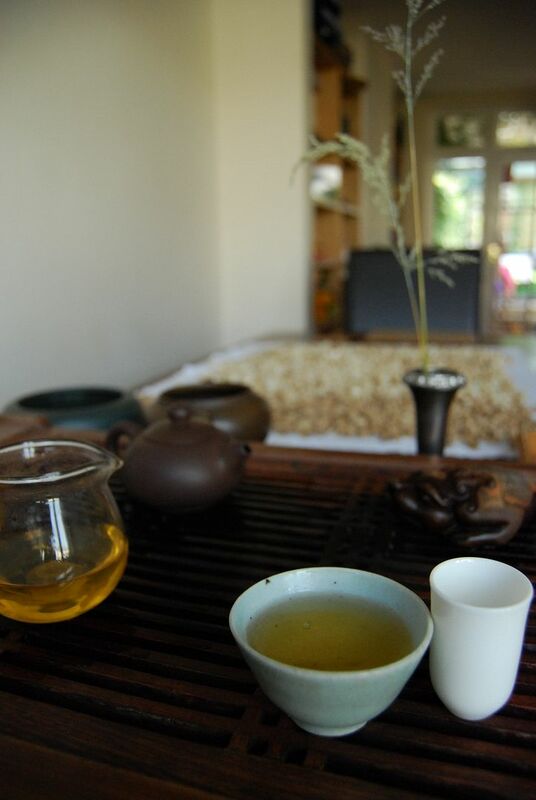 Not pictured below is the sweet base of Yiwu that wakes me up. Also not pictured below is my considerable hangover, following a night listening to an unfathomably loud metal band (Soulfly) with some of my old chums. For those of you wondering what happened to Sepultura after Max Cavalera left, look no further. 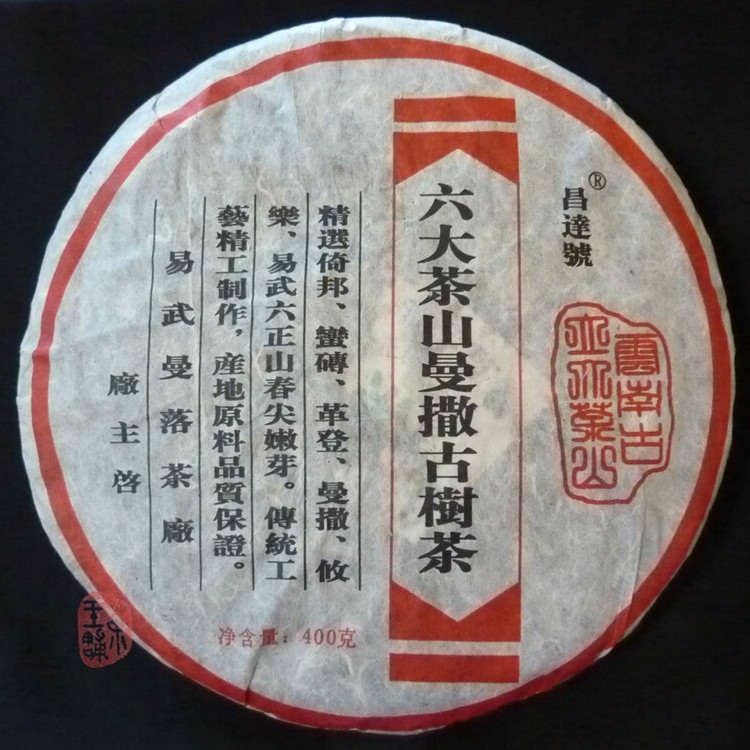 This Yiwu Zhaochun has the sweetness required to brush away the pulsating agonies of cheap nightclub beer, and gets to work quite promptly on restoring my body to full capacity. The next day, I enjoyed a cake that has a really rather amusing name. We are accustomed by now, Gentle Reader, to the desire for cake producers to dedicate their cakes from everything to the 7th anniversary of their company to the opening of a new bank (I kid ye not). 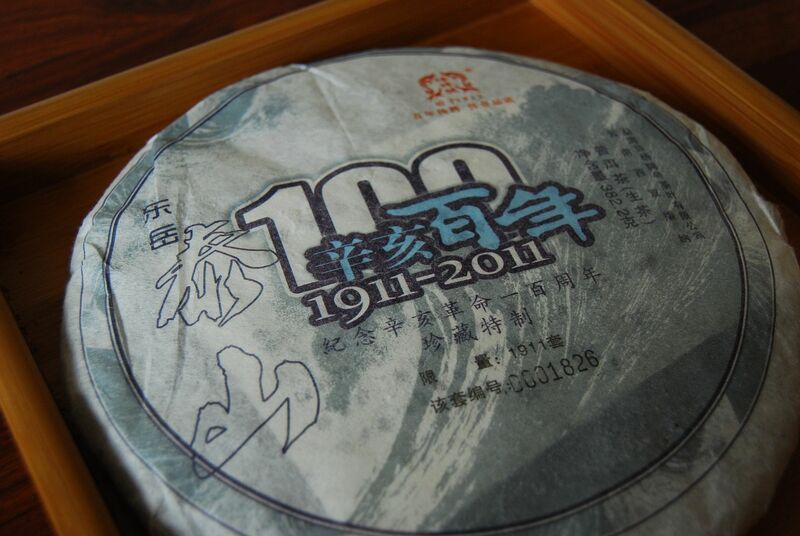 This cake celebrates one century since the Xinhai Revolution of 1911. You must really, really want to have seen the end of the Qing Dynasty to make a cake like this. Nationalist jingoism aside, this is a very pleasant cake. 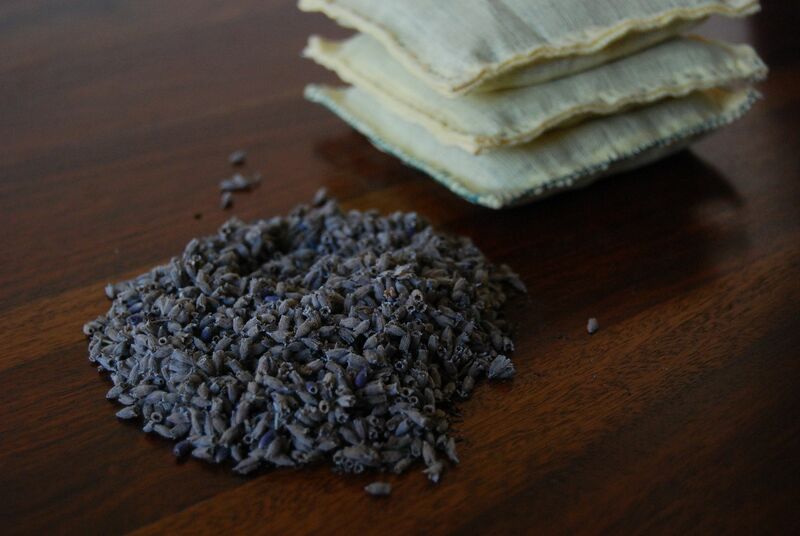 Pictured below, the leaves are long and well-pressed, and have a solid, sweet fragrance that fills me with hope. That this cake is still young probably accounts for the lack of obvious Singaporean darkness. 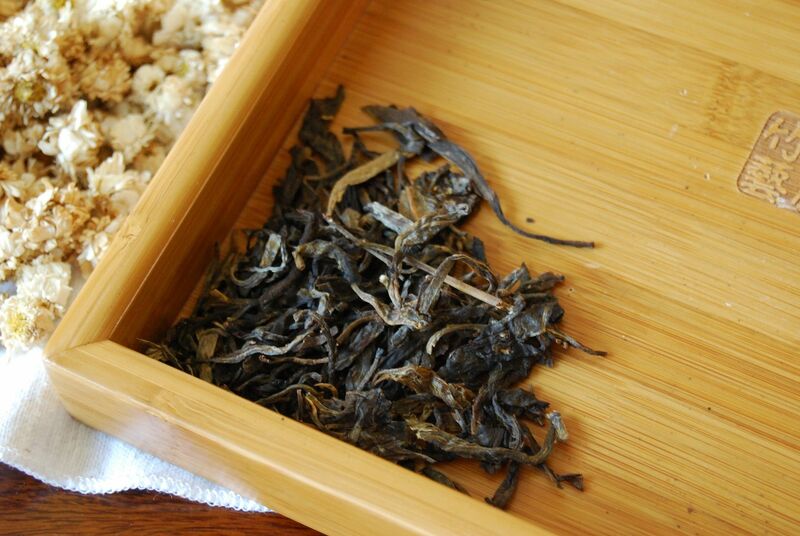 Unlike the Zaochun, this is a little more basic - but most enjoyable in its sweetness. 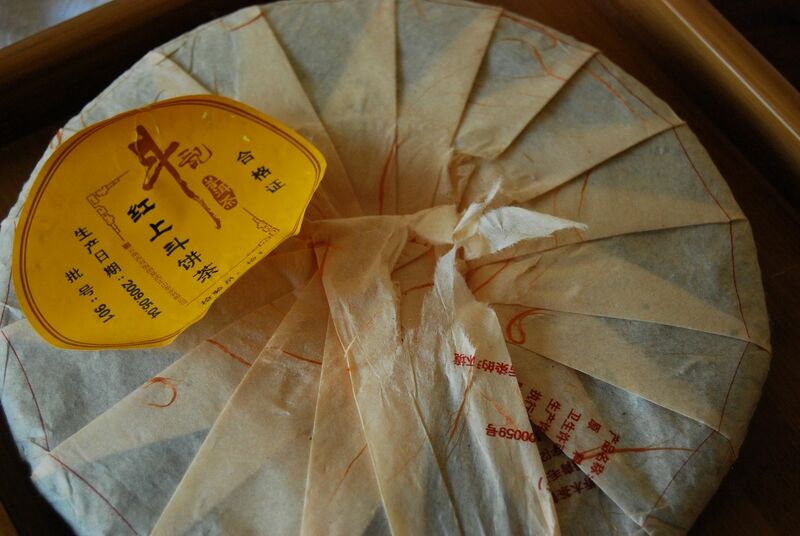 There is some roughness around the edges, as befits a label such as Yangpinhao, but even a cake of this humble character will probably be rather delicious after further years spent in Singapore. As for this cake, aging in England, I can expect a slower trajectory, but hopefully one that is decent. 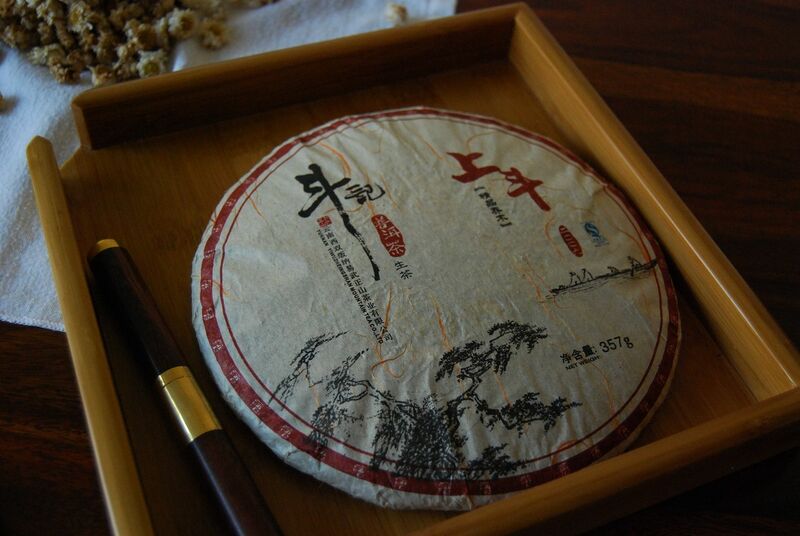 I cheekily took great pleasure in drinking this Xinhai cake from a Qing Dynasty cup, pictured above. 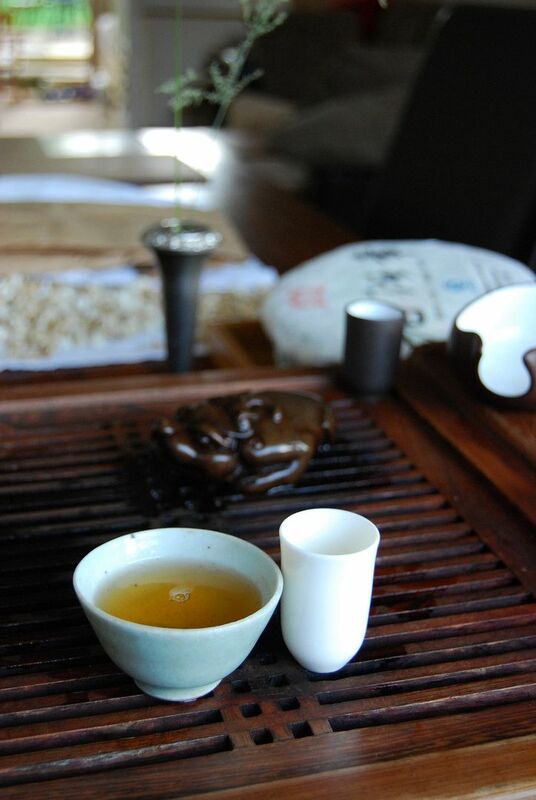 I won't get onto the subject of Chinese politics, as the tea-table is never a good place to examine such things. I will instead thank my good friend Keng most sincerely for this very generous gift.